This straight bong from Grace Glass is part of thenew collection Hammer series, called "the Rasta Skull". With an height of 48 cem and a steady base of 30 mm thickness this piece of glass is really hard to breake. Simple in the composition but with a very luxury details lilke the hand made 3d printing give to this bong a particular appeal. 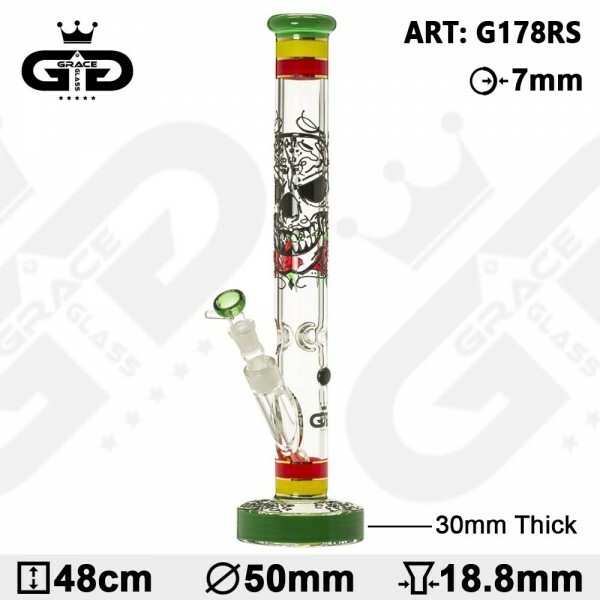 Made in high quality borosilicate glass this model is equipped with a chillum diffuser of 29.2 mm diameter and lenght of 13 cm and a 18.8mm bowl with handle. Discover all the new arrival from Grace Glass.